The yield curve is properly the set of all yields for all maturities at a given time. The shortest maturity is overnight, and the longest depends upon the market. The yield curves, in most developed countries, are defined at least to 30-year maturity, but in some cases, yield curve fittings will create a fair value estimate for the yield up to infinite maturity (perpetual bonds). (Perpetual bonds, known as consols, are rare as traded instruments, but show up in theoretical work. It is easier to track a single stock of perpetual bonds than a group of bonds with staggered maturity dates.) The curve is either fitted from a set of bonds, or based on swaps, for which there are price quotes at standard maturities. 2-/10-year slope = (10-year yield) – (2-year yield). A standard piece of terminology refers to the sign of the slope as an economic variable: whether it is positively or negatively sloped. A positive slope (or upward-sloping curve) is a yield curve in which the long maturity is at a higher yield than the short maturity. This is considered a “normal” yield curve state. A negative slope (or inverted yield curve) results when the long maturity yield is less than the short maturity yield. This is relatively rare for standard slopes, and is usually taken as a sign of an imminent recession (for reasons to be discussed below). The chart above shows the history of the 2-/10-year Treasury slope, along with NBER-defined recessions. 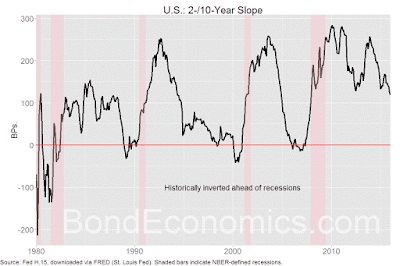 We see that the curve inverted solely ahead of recessions. 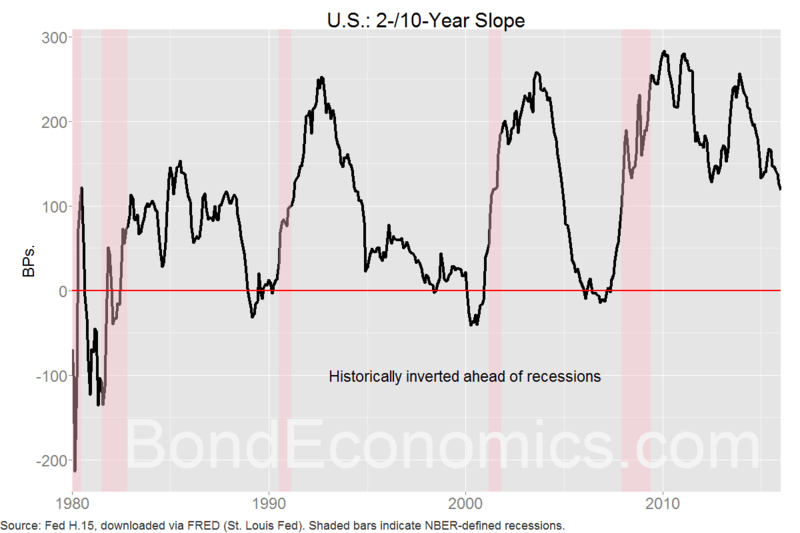 This track history has meant that the 2-/10-year and similar slopes have been used as components of leading economic indicators, or for recession-prediction models. Rate expectations explain why the 2-/10-year slope works as an indicator. The short maturity leg (the 2-year yield) is very closely tied to the current level of the policy rate and the expectations for that rate over the coming two years. 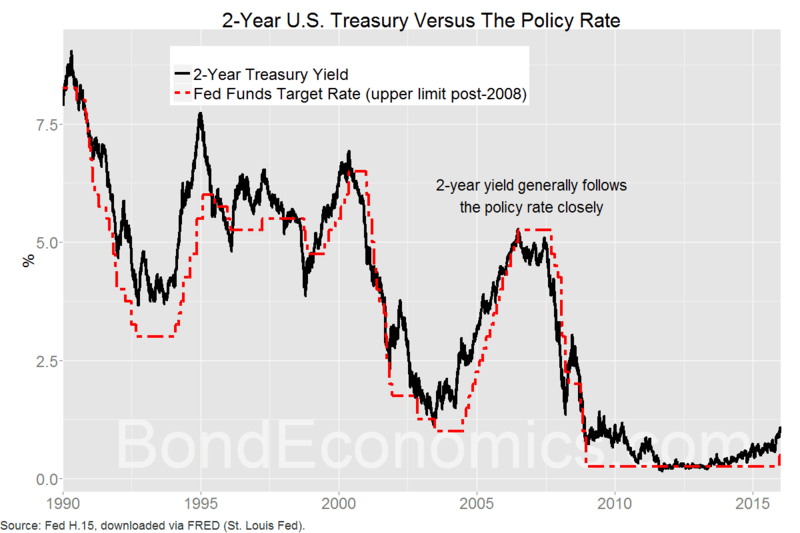 The chart above demonstrates how the 2-year yield tracked the policy rate, although with some periods of divergence (notably during the 1994 bond bear market). The central bank will quite often move the policy rate to what the market feels is an “extreme” level in order to stimulate or slow the economy, and the 2-year will follow the policy rate. 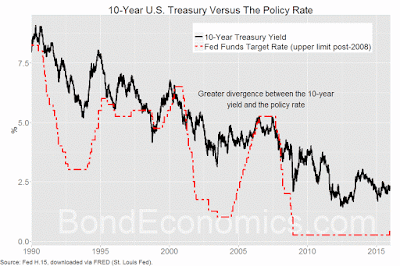 Meanwhile, the long maturity leg (the 10-year yield) represents the average policy rate over a much longer period. Nobody has any reason to have a detailed economic forecast over such a long period. Instead, the market will tend to keep the expected average of the policy rate starting several years forward near a “neutral” level. (Additionally, the 10-year would presumably have a greater term premium than a 2-year, dragging the long leg’s yield higher than the short leg’s.) 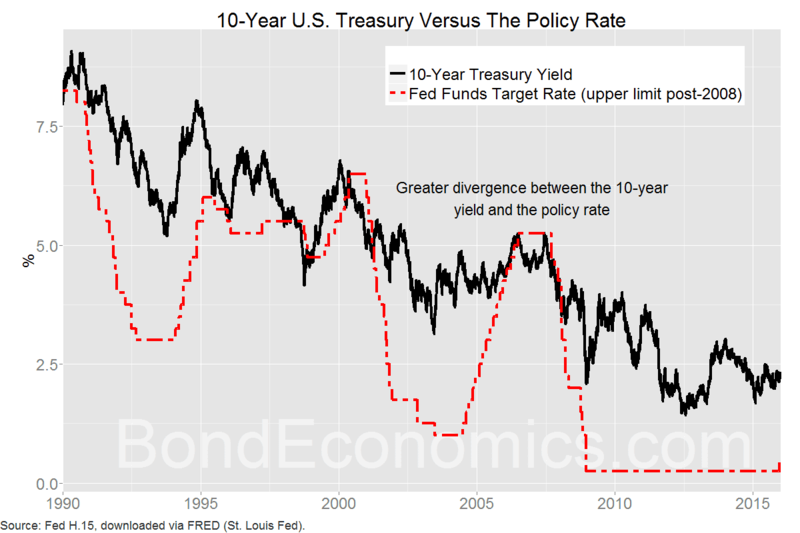 The chart above demonstrates the tendency of the 10-year yield to diverge from the policy rate (particularly when compared to the 2-year yield). Taken together, the 2-year yield moves along with the current stance of policy, while the 10-year yield tends to show greater stability. As a result, when the central bank has cut rates and is keeping policy “easy,” the yield curve has a positive slope. Conversely, if the economy is heading into recession, the central bank is generally one of the last entities to react. Short maturity yields remain elevated near the current policy rate, while the long maturities plunge as they move to price in the need for extensive rate cuts. This means that the central bank’s reaction function is an important component of slope behaviour. If the central bank was consistently forecasting economic growth better than the markets, and so was able to avoid recessions, there would be no reason to expect that the slope would have any forecasting power. It would largely just reflect the play of risk premia in the bond market. The advent of ultra-low rates complicates the picture slightly. So long as the markets view deeply negative interest rates as unlikely (Section 2.8), there is an upward bias to rate expectations when the policy rate is near zero. 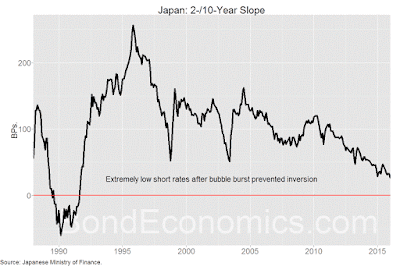 If the economy does not grow, rates will be stuck near zero (as in Japan). However, if the economy starts to grow again, rates can only go up. 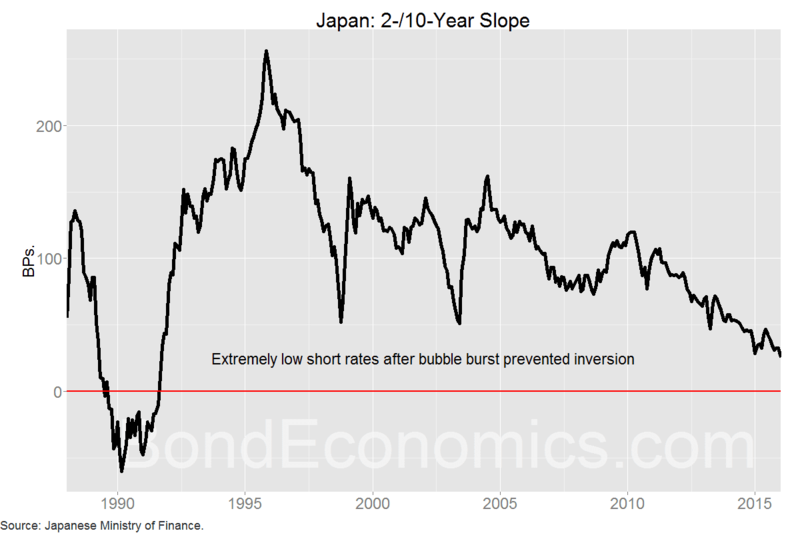 This explains the generally persistent positive slope in Japan, as seen in the chart above. Nevertheless, the Japanese bond curve has recently allowed for a negative 10-year yield, which does increase the possibility that the yield curve could move more symmetrically. Although other slopes are likely to remain correlated with the 2-/10-year slope, the relationships become less clear once maturities start to lengthen. For example, the slope between a 20-year and 30-year tells us almost nothing about monetary policy, rather it tells us about term premia in the long end of the yield curve. Those long end slopes are of interest for relative value trades, but not for economic analysis. Finally, the introduction of default risk changes how slopes operate. If an issuer is about to default, all bonds will tend to trade near the expected recovery value, regardless of the bond maturity. This creates an inverted yield curve. Some commentators incorrectly draw this analogy when a government yield curve inverts. So long as the yields are well below 20% (at which point the usual convention is to stop quoting bond yields, and only quote bond prices), a long maturity yield trading below a short maturity yield tells us little about default risk. The slope tends to move in the opposite direction of the policy rate. This is a factor limiting the effect of the policy rate upon the economy. If the central bank cuts rates rapidly, the slope of the curve can be quite positive. As a result, borrowers who want to lock in a longer term of interest, such as in most fixed mortgages in the United States, will not see as low a rate as is implied by the overnight rate. Conversely, term interest rates can fall during a rate hike cycle, which reduces the ability of the central bank to dampen activity. This was seen as an issue during the rate hike cycle of the 2000s, as discussed in the next section [Rate Hike Cycles and Bond Bear Markets]. More information about Interest Rate Cycles is found here.